Gentamicin Sulfate, a water-soluble antibiotic of the aminoglycoside group, is derived by the growth of Micromonospora purpurea, an actinomycete. Staphylococcus aureus, Staphylococcus epidermidis, Streptococcus pyogenes, Streptococcus pneumoniae, Enterobacter aerogenes, Escherichia coli, Haemophilus influenzae, Klebsiella pneumoniae, Neisseria gonorrhoeae, Pseudomonas aeruginosa, and Serratia marcescens. 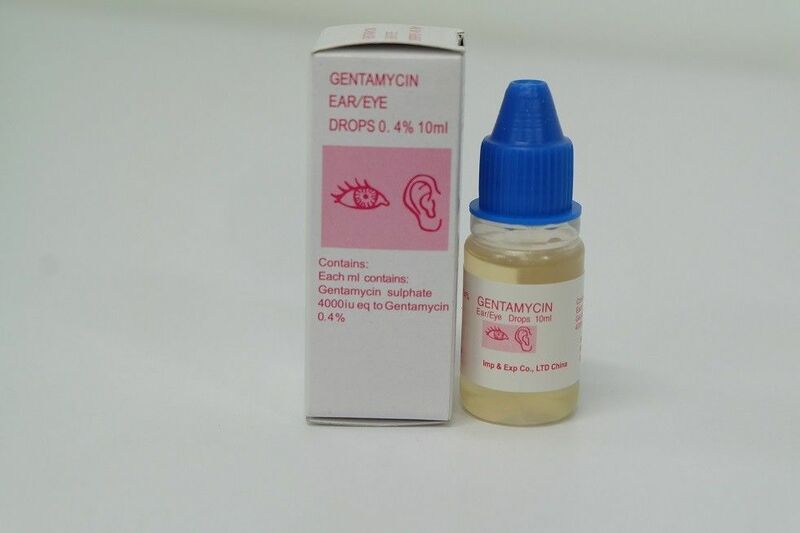 Gentamicin Sulfate sterile ophthalmic solution; Instill one or two drops into the affected eye(s) every four hours. In severe infections, dosage may be increased to as much as two drops once every hour. Prolonged use of topical antibiotics may give rise to overgrowth of nonsusceptible organisms including fungi. Bacterial resistance to gentamicin may also develop. If purulent discharge, inflammation or pain becomes aggravated, the patient should discontinue use of the medication and consult a physician. If irritation or hypersensitivity to any component of the drug develops, the patient should discontinue use of this preparation and appropriate therapy should be instituted. To avoid contamination, do not touch tip of container to the eye, eyelid or any surface. There are no published carcinogenicity or impairment of fertility studies on gentamicin. Aminoglycoside antibiotics have been found to be non mutagenic. Gentamicin has been shown to depress body weights, kidney weights and median glomerular counts in newborn rats when administered systemically to pregnant rats in daily doses approximately 500 times the maximum recommended ophthalmic human dose. There are no adequate and well-controlled studies in pregnant women. Gentamicin should be used during pregnancy only if the potential benefit justifies the potential risk to the fetus. Safety and effectiveness in neonates have not been established. Gentamicin is a broad spectrum aminoglycoside antibiotic. Aminoglycosides work by binding to the bacterial 30S ribosomal subunit, causing misreading of t-RNA, leaving the bacterium unable to synthesize proteins vital to its growth. Aminoglycosides are useful primarily in infections involving aerobic, Gram-negative bacteria, such as Pseudomonas, Acinetobacter, and Enterobacter. In addition, some mycobacteria, including the bacteria that cause tuberculosis, are susceptible to aminoglycosides. Infections caused by Gram-positive bacteria can also be treated with aminoglycosides, but other types of antibiotics are more potent and less damaging to the host. In the past the aminoglycosides have been used in conjunction with penicillin-related antibiotics in streptococcal infections for their synergistic effects, particularly in endocarditis. Aminoglycosides are mostly ineffective against anaerobic bacteria, fungi and viruses. Aminoglycosides like gentamicin "irreversibly" bind to specific 30S-subunit proteins and 16S rRNA. Specifically gentamicin binds to four nucleotides of 16S rRNA and a single amino acid of protein S12. This interferes with decoding site in the vicinity of nucleotide 1400 in 16S rRNA of 30S subunit. This region interacts with the wobble base in the anticodon of tRNA. This leads to interference with the initiation complex, misreading of mRNA so incorrect amino acids are inserted into the polypeptide leading to nonfunctional or toxic peptides and the breakup of polysomes into nonfunctional monosomes.